Occasiomaly we get some celebraties and well known artists through our door but this was an absolute treat after we’d somewhat caught olympic fever at the framers during the games. 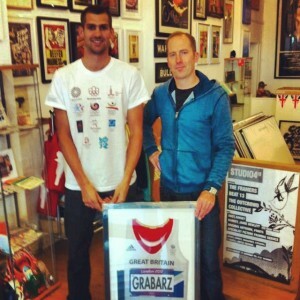 Robbie Grabarz, olympic high jump bronze medalist bought his vest he was wearing when he won the medal to get framed, what an honour and he seemed pretty pleased with our handy work! You are currently browsing the archives for the specialist framing category.